Custom home in The Parks on a beautifully landscaped .32/AC lot, just a short walk to the pool. This light-filled home features gorgeous wood floors, soaring ceilings, wood trim throughout, and a fantastic great room designed for entertaining. The remodeled chef's kitchen has solid surfaces, large working island, and professional grade stainless appliances. Main level Master Suite offers vaulted ceilings, large windows and access to backyard. Spacious Master Bath with dual vanity, tiled shower and large spa tub. Additional main level highlights include completely remodeled office with French doors, custom built-ins and fabulous bonus room. Jr. Master Suite with walk-in closet and full bath, 2 additional large bedrooms and additional full bath upstairs. 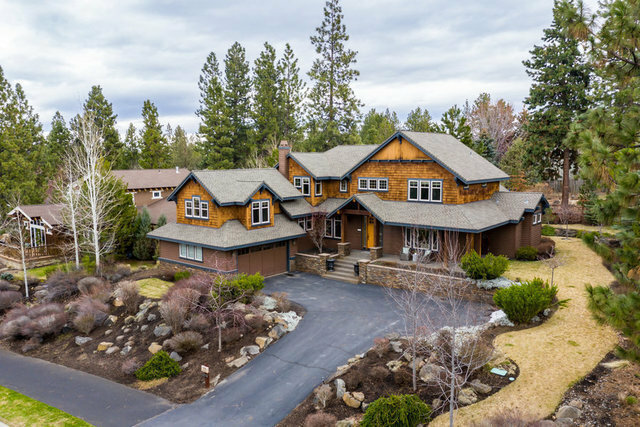 Exquisite backyard oasis landscaped and fenced, featuring flagstone patio and large custom gas fire pit IDEAL for those beautiful Central Oregon evenings. Cascade Mountain views from upstairs!